The Weimaraner or “Silver Ghost” is a highly-energetic, intelligent, friendly and affectionate dog. Originally bred as a gundog to handle big game like deer and bear, he was a highly sought-after dog breed in its native Germany. The Weimaraner dates to the early 19th century, when he was developed at the Weimar court in what is now Germany. The noblemen loved hunting and wanted a dog with courage, intelligence, good scenting ability, speed, and stamina. How they achieved their dream dog, first known as the Weimar Pointer, is unknown, but it's believed that the breeds used to create the Weimaraner included the Bloodhound, the English Pointer, the German Shorthaired Pointer, the Great Dane, and the silver-gray Hühnerhund (chicken dog). In 1897, an exclusive club was started in Germany to maintain the breed and no one was permitted to buy a Weimaraner unless they joined the club. Strict guidelines were imposed upon the breeding of Weimaraners. 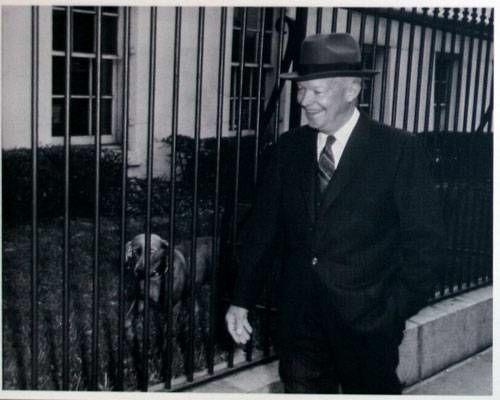 During World War II, it became difficult for German breeders to keep their dogs, so many outstanding Weimaraners were sent to the U.S. At the end of World War II, many American servicemen brought Weimaraners home with them, and they quickly grew in popularity, after President Eisenhower brought his Weimaraner - Heidi - to the White House. The Weimaraner is a powerful-looking dog, well-muscled for strength and stamina and deep-chested for endurance. The coat is short, smooth, sleek, and solid-coloured, ranging from mouse-gray to silver-gray, usually with lighter shades on the head and ears. 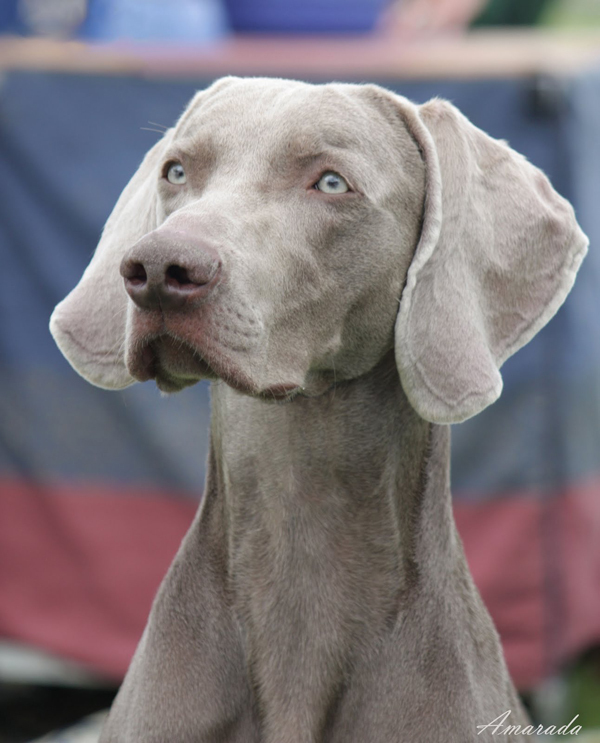 The Weimaraner head is aristocratic, with muzzle and skull being the same length. Eyes must be light amber, gray, or blue-gray; ears are fairly long and are set high on the head and folded over. The nose is dark gray and the skin pink (not white or black) inside the flaps of the ears and on the lips. The Weimaraner is a housedog however he’s not suited to apartment living. This highly active dog needs both a large, securely fenced backyard where he can run and an active family who can provide him with the exercise and mental stimulation he needs. 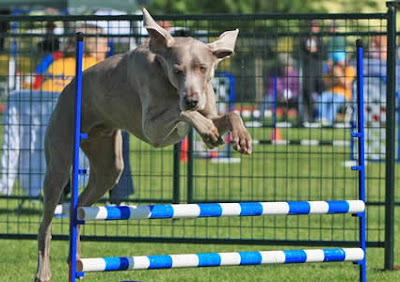 Weimaraners need a couple of hours of exercise daily if you want to prevent recreational barking, digging and chewing. You could play fetch and other running games, take him jogging or hiking, teach him to run alongside your bicycle, or get him involved in a dog sport such as agility or flyball. In the house, a mature, well-trained Weimaraner will be your shadow, from bedroom to bathroom to kitchen to den. Weimaraners are more prone than many breeds to suffer from separation anxiety and can become destructive and "dig" in your carpet or sofa in an attempt to create a secure nest. Weimaraners are highly intelligent, but they're also independent thinkers. This combination can make them a challenge when it comes to training. Be consistent and firm, but gentle. Among the tricks your Weimaraner may learn are getting ice from the dispenser in the door of your refrigerator, turning on faucets, and opening gates and doors. Hip Dysplasia: This is an abnormality of the hip joint. It may affect one or both sides. Dogs with hip dysplasia may or may not show any clinical signs. Although the tendency toward hip dysplasia is thought to be inherited, diet, rapid growth, and environment also are thought to be contributors to the condition. Bloat or Gastric dilatation-volvulus (GDV): This is a life-threatening condition that can affect large, deep-chested dogs, especially if they are fed one large meal a day, eat rapidly, drink large volumes of water after eating, and exercise vigorously after eating. Some think that raised feeding dishes and type of food might be a factor in causing this to happen too. It is more common among older dogs. A Weimaraner is one of the easiest breeds to groom. Even when he has been running through mud, the dirt just seems to fall off him. Weekly brushing with a bristle brush should keep his coat and skin healthy. Weimaraners shed, but brushing will help keep loose hair off your clothes and furniture. Bathe when needed. He takes great pleasure in rolling in anything stinky, so this may be more often than would normally be necessary. All breeds with hanging ears are prone to ear infections. Check your Weimaraner's ears weekly and wipe them out with a cotton ball moistened with a cleanser recommended by your veterinarian. 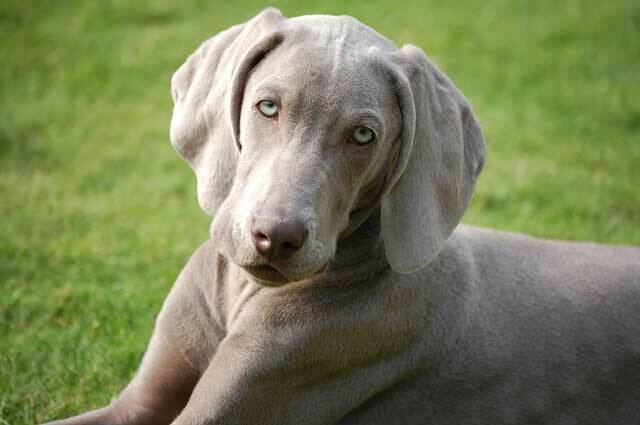 Your Weimaraner may have an ear infection if the inside of the ear smells bad, looks red or seems tender, or he frequently shakes his head or scratches at his ear. The high-energy Weimaraner needs an athletic owner willing to meet his demanding exercise needs: running, biking, hiking, jogging etc. Too much confinement leads to hyperactivity and destructiveness, as does being left alone too much. A bored Weimaraner will bark up a storm, demolish your home and garden and even attempt to escape in search of adventure. Reserved with strangers, dominant with other dogs, predatory toward small animals such as cats, rabbits or birds, most Weimaraners need an owner who can provide leadership, socialisation, and training beyond the beginner level. If you can provide the time and attention this dog needs, you will be rewarded with a loyal and affectionate pet that loves nothing more than being by your side.